Above photo showing "Porcupine House" by Rev. Octavius Walton, vicar of Leigh 1906-18. The only reference I have found so far for this pub is in the Pigot's Directory of 1828. From the Parish Magazine Article: Feb 2005: by Chris Rowley. 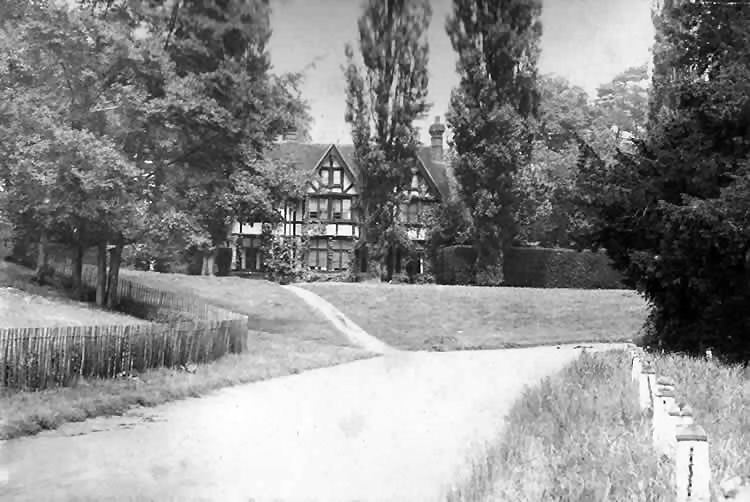 The black and white house by East Lodge, now known as “Porcupine House”, was called “The Gate House” from 1900-1980 and belonged to the Hall Place Estate. In 1951 Hilary and Rosemary Magnus rented it. In this note Rosemary Magnus recalls the Leigh that they knew over the following 28 years. On their first Sunday at St Mary's they were ushered by the Verger, Charlie Ingram, into The Gate House pew, the third from the front on the right hand side, behind Lord Kindersley's family from Ramhurst. Mr Magnus later became the Vicar's Warden under both the Rev. John Eyre-Walker and the Rev. John Bounds. He was a barrister and later a judge and was also on the Tonbridge bench as a magistrate. Each morning he would drive to the station where there were only six or seven cars parked. He and his first class companions got to know and greatly appreciate the station staff there. Each summer there were traction engine rallies and caravan rallies in Hall Place, both using the East Lodge gate. Mrs Magnus recalls how surprising it was each time when “an instant village appeared on our doorstep”. Also in the Hall Place Park were the sixty deer. “The trouble was they kept escaping. Once, one of them jumped right over my Mini”. “Lord Hollenden allowed us to buy the house in 1959 – one of the first estate houses to be sold. We lived there until 1979 and then sold it to the Barrows, who changed the name back to what it had been in the 18th and 19th centuries – Porcupine House.